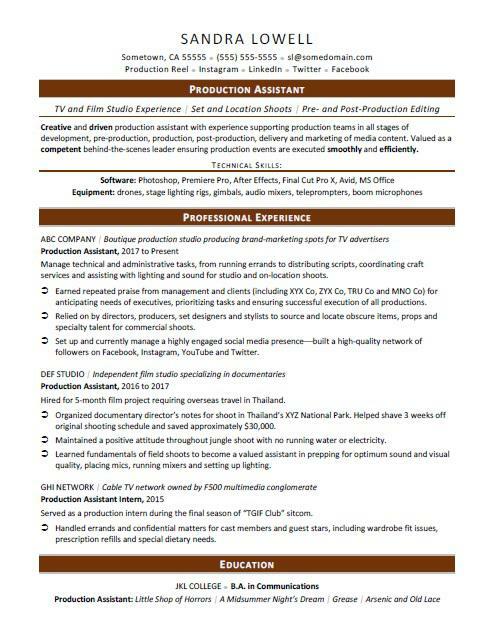 View this sample resume for a production assistant, or download the production assistant resume template in Word. Does getting a new job feel like a giant production? Let your resume be your assistant. To be considered for top production assistant jobs, resume expert Kim Isaacs says it helps to have a comprehensive resume. For resume writing tips, view this sample resume for a production assistant that Isaacs created below, or download the production assistant resume template in Word. Jobs in this field are projected to grow by 12% (or 16,500 jobs) from 2016 through 2026, which is faster than average, according to the Bureau of Labor Statistics (BLS). You'll find the highest level of employment for producers and directors in the following states: California, New York,​ Florida, Texas, and Georgia; and in the following metropolitan areas: Los Angeles, New York City, Atlanta, Chicago, and Washington D.C. The median annual wage for producers and directors is $71,620 per year, or $34.43 per hour, according to the BLS. Additionally, you can search for production assistant jobs on Monster. Creative and driven production assistant with experience supporting production teams in all stages of development, pre-production, production, post-production, delivery and marketing of media content. Valued as a competent behind-the-scenes leader ensuring production events are executed smoothly and efficiently. Manage technical and administrative tasks, from running errands to distributing scripts, coordinating craft services and assisting with lighting and sound for studio and on-location shoots. Earned repeated praise from management and clients (including XYX Co, ZYX Co, TRU Co and MNO Co) for anticipating needs of executives, prioritizing tasks and ensuring successful execution of all productions. Relied on by directors, producers, set designers and stylists to source and locate obscure items, props and specialty talent for commercial shoots. Set up and currently manage a highly engaged social media presence—built a high-quality network of followers on Facebook, Instagram, YouTube and Twitter. Hired for 5-month film project requiring overseas travel in Thailand. Organized documentary director’s notes for shoot in Thailand’s XYZ National Park. Helped shave 3 weeks off original shooting schedule and saved approximately $30,000. Maintained a positive attitude throughout jungle shoot with no running water or electricity. Learned fundamentals of field shoots to become a valued assistant in prepping for optimum sound and visual quality, placing mics, running mixers and setting up lighting. Served as a production intern during the final season of “TGIF Club” sitcom. Handled errands and confidential matters for cast members and guest stars, including wardrobe fit issues, prescription refills and special dietary needs. Before your resume makes its big debut on the job-search circuit, you need to ensure that every line is in the proper place. Could you use a little direction? Get a free resume evaluation today from the experts at Monster's Resume Writing Service. You'll get detailed feedback in two business days, including a review of your resume's appearance and content, and a prediction of a recruiter's first impression. Let Monster's experts help your resume get you your big break. Warehouse Production Assistant - Day / Swing Shifts - Start Immediately!